This IC is a programmable, two-channel frequency-to-digital converter for use with any frequency, period, duty-cycle, time interval, phase-shift and pulse number signal. The UFDC-1 converts any frequency-time domain signal to digital and uses four patented conversion methods. It works in 16 measuring modes, one generating and calibrating mode. 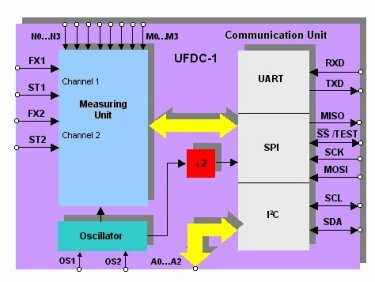 The UFDC-1 lets embed frequency-to-digital conversion into smart sensors. Features: frequency range from 0.05 Hz to 7.5 MHz (120 MHz with prescaling); programmable accuracy from 1% to 0.001 %; non-redundant conversion time; quartz-accurate automated calibration; RS-232, SPI and I2C interfaces; master and slave communication modes; single power supply 4.5 - 5.5 V; current consumption at 16 MHz, 5V, 25 0C below 20 mA; operating temperature range (- 40 0C to + 85 0C); 28-lead Plastic Dual Inline Package (PDIP); custom design available. The UFDC-1 can also work with voltage and current output sensors. It this case, any voltage–to-frequency converter (VFC) can be used. The accuracy of such system will be determined by sensor accuracy as well as by VFC accuracy. For more details about the UFDC-1 please visit our online store.